I mentioned recently that they’re in the process of rejoining the ring canal that circles the old city center of Utrecht. Most of the canal has remained, but a section on the western side of town was turned into a highway. However, that road was closed in 2010 and the process of turning it back into a canal (and connecting it with the canal that remains) then began. It’s part of an ongoing project to rebuild that part of town, making it more attractive, inviting, and useful. 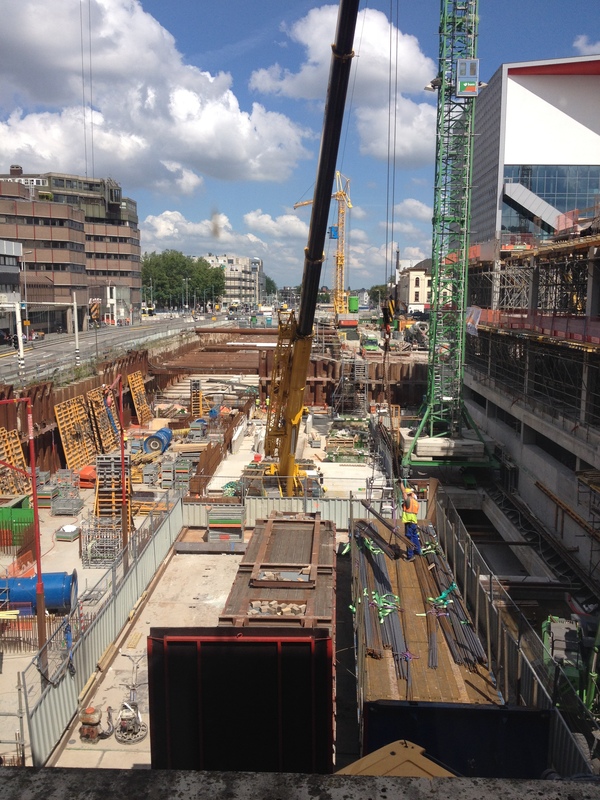 This is the view from the Hoog Catharijne mall, looking down on what will eventually be a canal once again. This photo is from a few months back, probably around early July. It doesn’t look like it is ready for water, and to be honest, I’m not sure if that section is yet, but they’re getting closer to filling in the water in one section of the rebuilt canal. I haven’t found any specific dates, but someone did pass along a handy link to a live webcam you can watch where the water will be added relatively soon. If you enjoy a good webcam it’s worth checking out. I’m slightly disoriented, but I think this is the northern bit that will be filled in first. If the camera were to keep panning to the right, I think it would eventually be facing the spot where I took my photo. Essentially, the webcam view is of the construction in the far distance of my photo. I think. Maybe. Perhaps. Cats and boxes go together like peanut butter and jam. 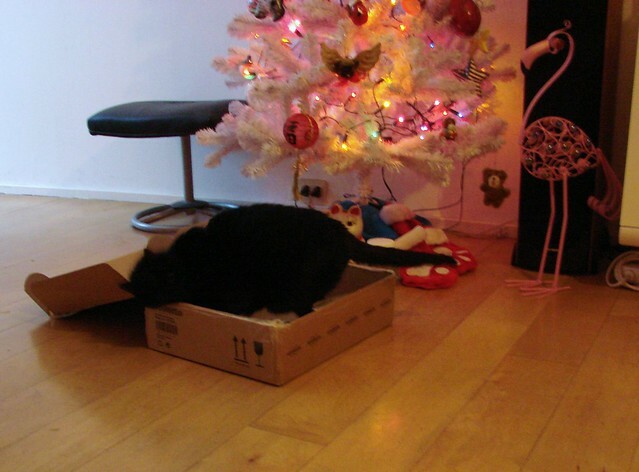 In our household, if there’s a box, there’s a cat either in it or on it. 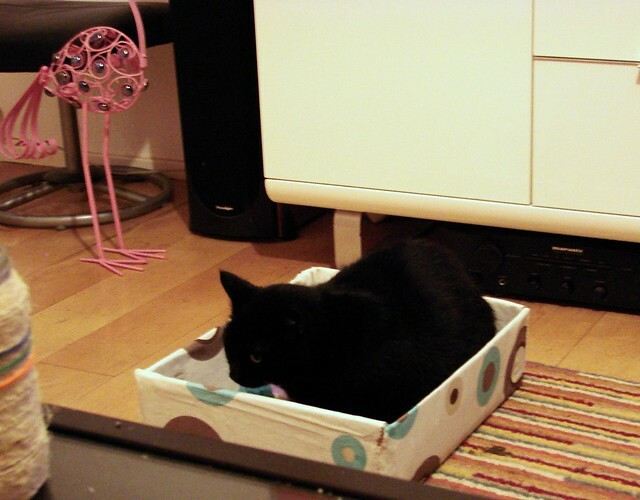 That’s pretty normal, as even wild cats, such as lions and tigers, have shown a fondness for boxes. There’s just something about boxes that cats love. Well, it turns out a couple of veterinary medicine researchers at Utrecht University have been studying this special relationship. 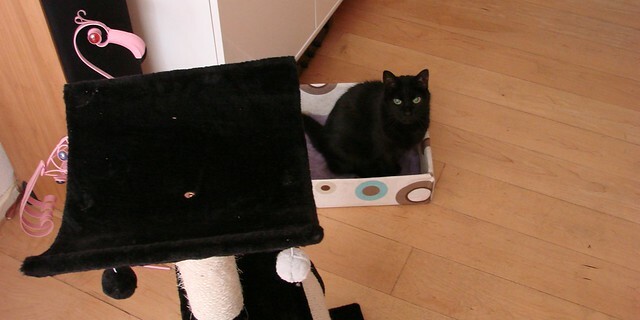 Ruth Van Der Leij and Claudia Vinke have found that boxes significantly reduce a cat’s stress levels. In their studies, they looked at the behaviour of cats who were in a two-week quarantine at an animal shelter. Half of the cats were given a box and half were not. 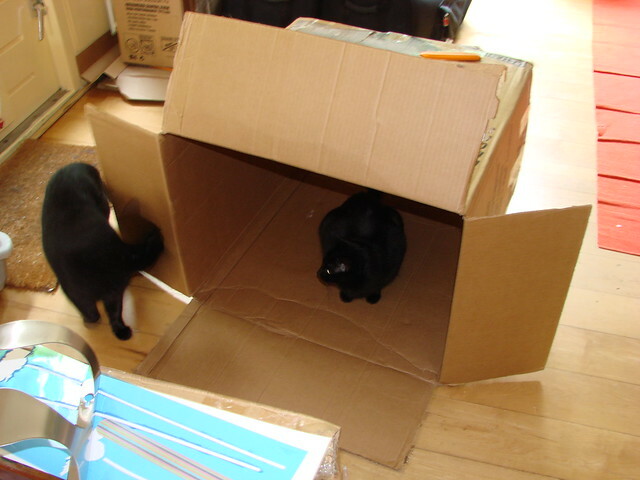 Those who had a box were significantly less stressed than their boxless counterparts and the box cats adjusted to their new environment more quickly. They also tended to remain healthier, due to reduced stress levels. 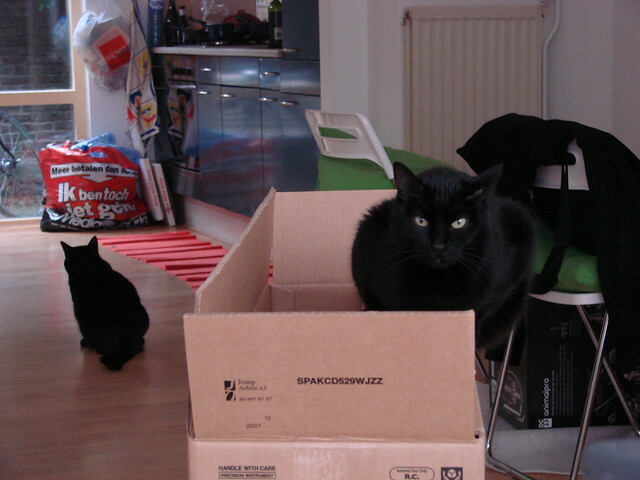 It was a month or so before we got a lot of boxes after we moved here, since the bulk of our boxes came much later. But we did pick up a few items in boxes when we first moved. Luna was appreciative. Lola sulked, while waiting her turn. Both cats liked it so much, I couldn’t bring myself to toss it. So I gussied it up a bit. I trimmed off the lid and then wrapped it in fabric and cut a fleece liner for it. We still have it, more than a year later. First up is Luna, followed by Lola. 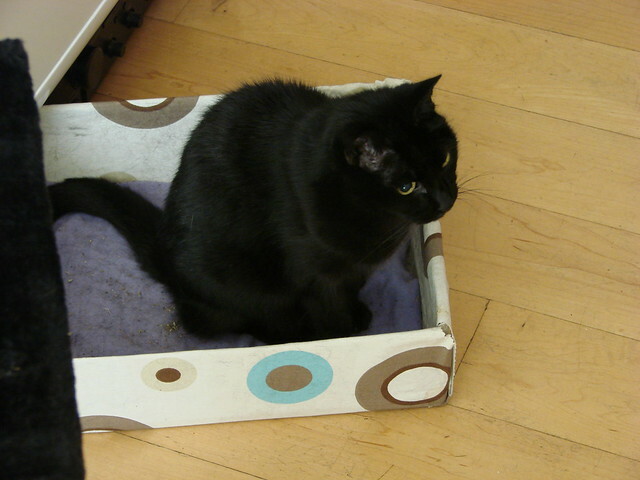 Luna does typically sit upright in it, while Lola tends to hunker down. But don’t even think of getting rid of the box. The wrath of the cats will be rained down upon you! However, some more catnip sprinkled in would be appreciated. By the way, I’m up for the “Top 100 International Exchange and Experience Blogs” competition. If you would like to vote for me, click the button below to get to the voting page. Much appreciated if you do! Voting runs through 15 February 2015. Thanks! A couple of days ago, CNN posted an article listing the most bike-friendly cities in the world. 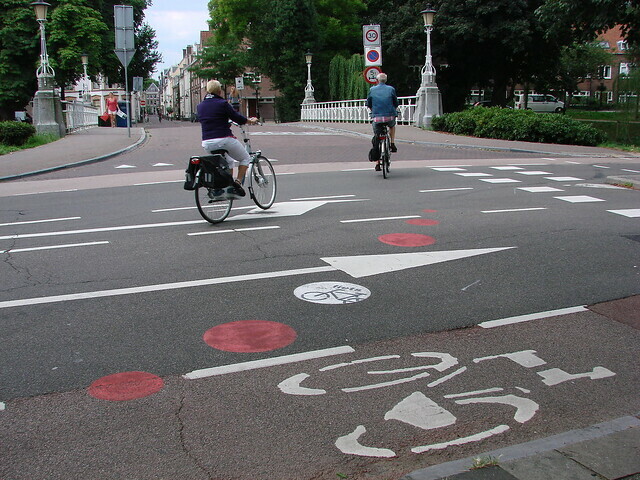 As they point out, the majority of the cities are found in northwest Europe, with the Netherlands, Sweden, Germany, and Denmark among those with the largest infrastructure to make cycling a safe, daily experience. Obviously, the Netherlands was bound to have a city or 20 in the list, but amazingly, they focused on Utrecht, rather than Amsterdam. 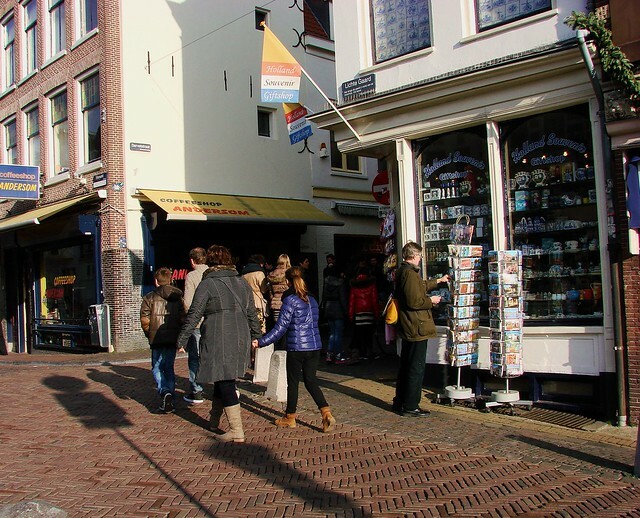 As they rightly point out, Amsterdam may often top these kinds of lists, but the number of tourists — on foot, and on wobbly bike — make cycling in Amsterdam much more challenging. On the other hand, Utrecht, which has no shortage of people cycling every day, doesn’t have quite the same influx of uncertain tourists. 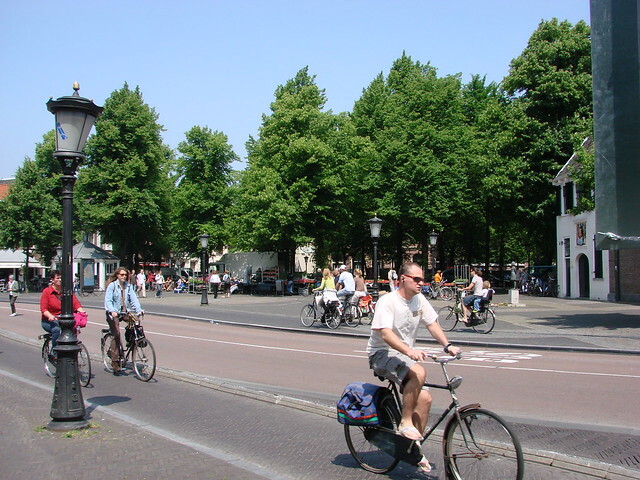 We do, however, have an extensive system of spacious, segregated bike paths, not to mention a reduction in the number of cars driving in the binnenstad (city center) itself. The car is being phased out and more support for bicycles is being developed. In its center, up to 50% of all journeys take place in the saddle and local authorities are building a 12,500-space cycle parking facility billed as the world’s biggest. That 12,500 bicycle parking garage is hardly the only one in town. It’s going to be by the train station where there are already a number of massive bicycle parking lots. There are others located throughout the city, both indoors and outdoors, as I’ve posted about in the past. I think tomorrow my Wordless Wednesday post will be some of the outdoor parking by the train station. After all, many people take the train to work, but cycle to and from the station to their home and work. As the article also mentions, people of all ages cycle here. Going to school, going to work, going shopping, going to see friends … everyone rides a bike. Men in suits, women in skirts and heels, and everything in between, with not a helmet to be seen. The system is set up to make cycling safe and easy, and obviously it works if half of all journeys here are by bike, rain or shine. 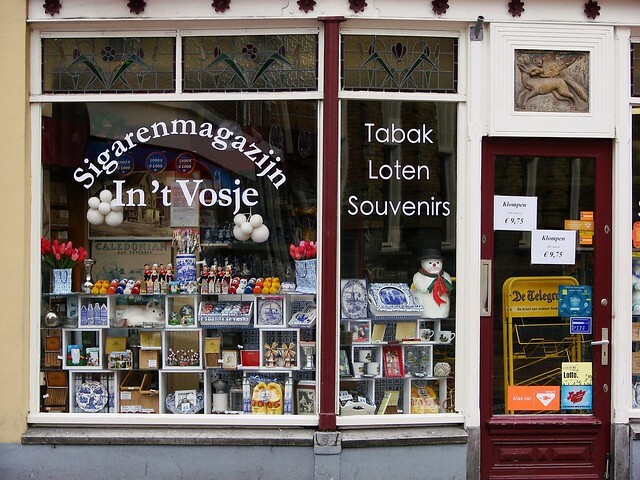 But now there’s also the corner news/tobacco/lottery ticket shop on Nobelstraat that has recently added a few classic souvenirs, as well. We’ve obviously hit the big time. This post brought to you with gentle, tongue-in-cheek snark. We’ve had a fair bit of rain the past few days, but not enough that I would have expected a whole chunk of the wall/road along the northern section of the Oudegracht to simply give way. Yet that’s what happened today. The eastern side of the Bemuurde Weerd has collapsed. The historic embankment dates back to 1300. 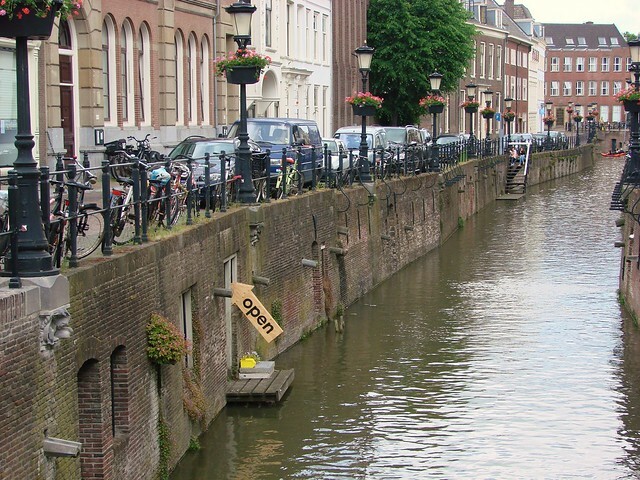 It is in this area that Sinterklaas arrives each year, and in fact, the part that collapsed seems to be right where I’ve stood in years past. It’s only about a month until Sinterklaas’s arrival, so I’m not sure what they’ll do now, since much of the surrounding area is unstable at the moment. So far, one tree has collapsed into the canal, blocking boats and taking part of the embankment with it. Another tree seems to be at risk, and the road/bridge next to the Nijntje Pleintje is also considered unstable at this point. According to some of the photos posted to Twitter, it looks like a cart and even a car are also at risk of going in. I’m sure the Dutch mastery over water will win out in the end, but for now, water has won this round. ETA: A few more photos and video of the disaster. And a depiction of what the original defensive gate looked like that stood on that spot. Now, CNN has posted an article about the new cities in Europe that everyone should be visiting. Rather than hit the usual spots, visitors should look into other equally appealing cities. For example, one close to my heart is the suggestion that instead of visiting Rome, people should check out the beautiful city of Bologna. And of course, instead of Amsterdam, come to Utrecht! My role as unofficial ambassador for Utrecht has been noticed, as well. 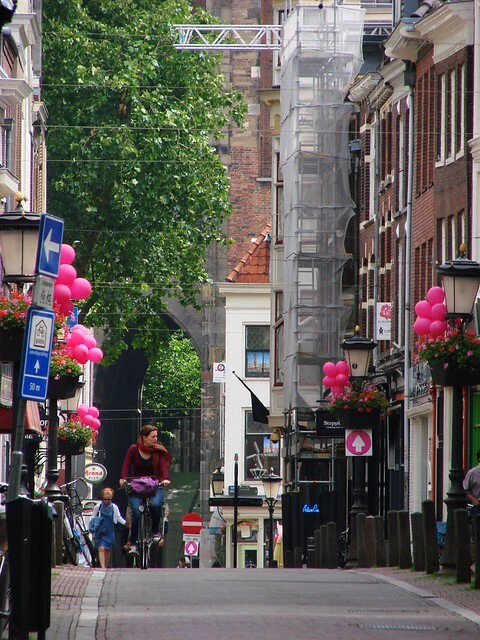 A new article on the Utrecht tourism website takes a look at some of the websites and the people behind them who are singing the praises of Utrecht. I’m thrilled to be included in such a great group, since they’re all websites that I already follow and find useful. Even if you can’t read the article, click on the links. Most of the sites have content in English. It’s always great to see the city get some recognition. If you’re coming to the Netherlands, do give us — and lots of other cities — a visit. But do please behave yourselves! Stay out of the bike paths, don’t litter, drink responsibly, and just be nice. For that matter, behave that way at home, too! Yesterday saw the opening of the highest mailbox in the Netherlands, located on the top of the Domtoren. Poor postal worker, having to climb all those stairs! That might make me want to go a bit postal, as well! 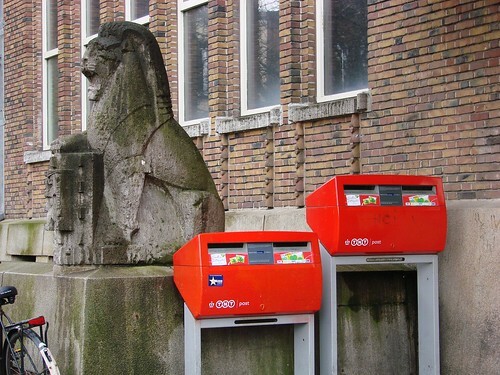 But seriously, from now until 5 May, anyone who takes a guided climb up the Domtoren will receive a special card that can be placed in this mailbox. However, the final recipients of the mail are limited to Queen Beatrix and soon-to-be King Willem-Alexander. People can have their personal messages delivered directly to the royal family. Why? Well, don’t forget that Willem-Alexander will become king in just a few more days on 30 April. This allows well-wishers to send a nice message to the outgoing queen and the incoming king. After a day spent wrestling with Firefox (which refused to play nice with the other programs I needed), I’m going to simply attempt a quick roundup post to cover a few things of interest. First up, you may remember the post I did about the recent theft of a monstrance (religious doodad) from the Catharijne Convent Museum. Well, it turns out that they caught the three people responsible and recovered the missing bit. The museum hopes to have it back on display soon. In other news, they’ve found the remains of another old boat near the Catharijnesingel. (Honestly, Utrecht isn’t like Atlanta where everything is named Peachtree, or in this case Catharijne. It’s just a coincidence.) The canal, which became a highway, which is reverting back to a canal, was the site of the recent archaeological excavation. In fact, for my British readers, you may appreciate the fact that it was found near the Boots pharmacy over by the train station. 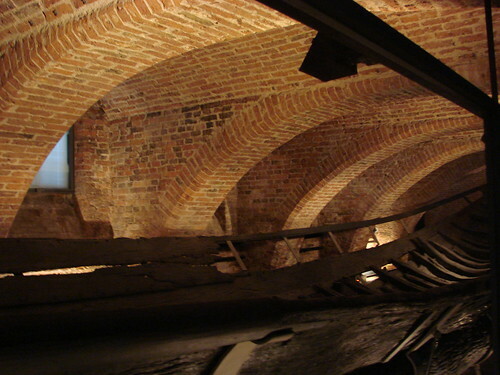 Anyway, the remains of the ship are oak and measure around 8 meters long and 2.5 meters wide. American (and some British) readers will have to do the metric to imperial conversion on their own, but trust me, it’s a good size. The boat dates to sometime between 500 to 1000 AD. It’s one of many boat remains that have been found in the general area in recent years. In fact, the really poor photo at the top is of a thousand-year-old boat that now stands in dry dock in the Utrecht Centraal Museum. You can literally smell the history when you step into that room. For what it’s worth, history smells a bit funky. You may remember reading about an art theft from a museum in Rotterdam last year. 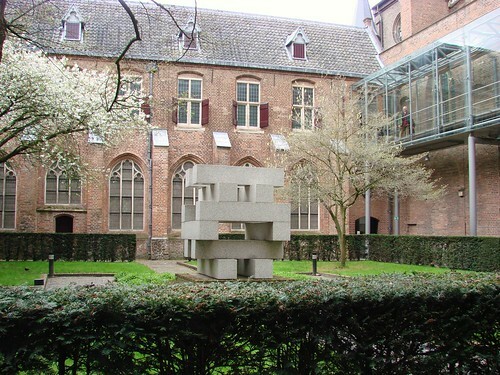 Well, this past week it was Utrecht’s turn to have a museum robbed. However, instead of famous paintings, this time it was a religious artefact stolen from the Catharijne Convent Museum. The museum is home to a number of religious artworks and reliquaries, and considering the gold and jewels used in many of the pieces, it’s not surprising that someone might try to make off with one. What is surprising is that the robbery took place during opening hours. The thief smashed the glass protecting the monstrance — a vessel used to store communion wafers — and grabbed it before security guards began struggling with the thief. In the end, the thief got away with part of the vessel, which is made of gilded silver and diamonds. A visitor to the museum actually managed to get a photo of the thief as he was running through the museum afterward with the vessel under his arm. The thief managed to get away on a moped, although it is thought that there may have been two men involved in the heist. The monstrance, which is on long-term loan to the museum from the parish of the Holy Trinity in Amsterdam, is worth €250,000. Ever since it was announced today that the European Union is the recipient of this year’s Nobel Peace Prize, there have been lots of jokes going around about everyone in Europe getting one of the awards. Just in case mine gets lost in the mail, at least I can say I’ve seen a Nobel Prize in real life. 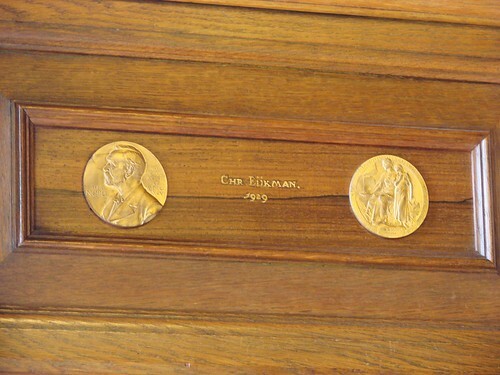 Christiaan Eijkman won his in 1929 and it now sits in one of the main rooms of Utrecht University’s Academiegebouw on the Domplein. Eijkman was a professor at the university and he won his prize in medicine for the foundation of the science of vitamins. 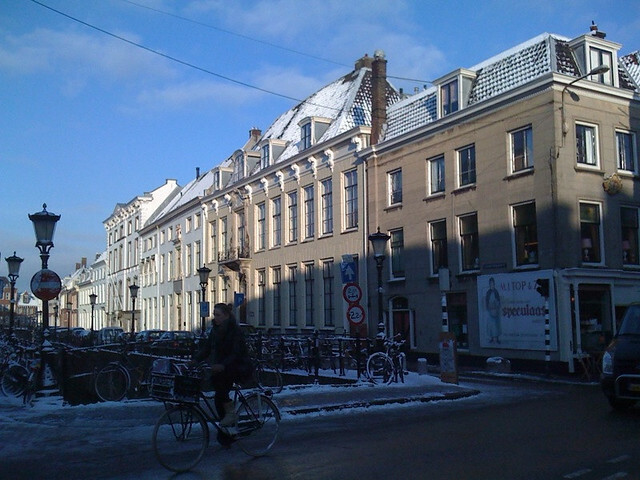 In all, 12 recipients of the prize have had some relationship with the Utrecht University.